It is generally recognized that after a time, the federal government gave up on pretty much all efforts at civil defense during the Cold War, except to protect Continuity Of Government and to attempt to not start a war to begin with. And I’m sure most people had no problem with this. Two seconds of thought point out how expensive it is to build shelters, as well as how impossible it is to get everyone out of a city. True, the Swiss and Soviets had Damn Skippy good CD programs, but there were obvious differences. The Soviets didn’t have, for all intents and purposes, private automobile ownership. They already had mass transit subway systems. It was pretty cheap to modify the subways into fallout shelters. They had existing infrastructure whereas we did not. And even though in theory we were as rich as the Swiss, national economics wise, they had far less people to protect and a much smaller area. That wasn’t the greatest excuse, as simply tax incentives would have worked here for private construction, but at least it was understandable. Yet, even with good reasons, there was still the knowledge the government was abandoning all civilians. I’m not even talking about tinfoil hat wearing students of deceit. Just the average Joe who believed all the government lies would still have felt the betrayal. And then you had all those stories about fallout from nuclear testing. The stories about terrible officers getting your buddies killed after you were drafted. After enough exposure, even the most patriotic at some point has to start believing the government is dangerous. At some point, you Go Galt in tiny ways. And that was prior to the economy taking a big dump. Once it started falling apart, how much more hate and discontent was there? After a thousand cuts, the death of inclusion occurs. You cannot opt out ( and now you are being forced to participate, which is far worse ) so you lose interest. You stop caring. It is a natural defense mechanism. So how far of a stretch does it become before you begin to assume the worst about our leaders? You don’t have to be a conspiracy theorist to conclude that even at their best behavior, politicians cannot afford to care about you. There are too many of you, and someone is always punished just for existing. The government couldn’t afford to shelter you from a war they started. And they can’t warn you because that would cause panic. So they just let you die. This is best exemplified by movies and books about asteroids headed towards earth. Obviously, I have personal issues with this. No, I don’t expect them to warn me. They are right. 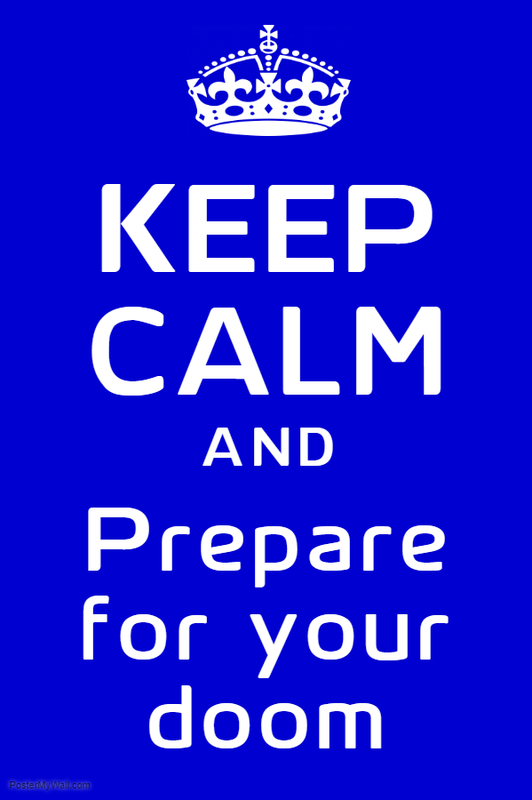 Since we are all unprepared ( large scale ), the panic would be too bad to encourage. I guess I just expect those we as taxpayers support to do their damn job and protect us. That is the only thing we ask, and they can’t do that. I don’t expect my own personal fallout condo to be furnished and provided by the government. But would local self defense organizations be so much to ask for? They used to have a name for them-the militia. It only takes leadership, direction and commitment, not money. Look at the LDS church and its culture of food storage. They educate on frugal means and provide infrastructure to provide affordable supplies. It isn’t a boondoggle. Local militias would arm themselves. It wouldn’t cost much money. Hell, I’m sure sworn LEO’s or even off duty National Guardsmen would volunteer as militia officers. The point is, there is little excuse to NOT provide and protect citizens. Even if they had to protect themselves and feed themselves, the needed leadership would provide structure to avoid panic and would decrease risk. I’m no Einstein and I can figure this out. How many others can, and so can’t help but feel the government hates them and wants them dead? Then, how much of a stretch is to conclude that there are others ways the government is lying and exposing them to danger? If the primary concern of the government is to keep order rather than protect its citizens, what ISN’T it lying about? We don’t want mass panic over food shortages, so don’t admit supplies are running out and we need to emergency buy from a foreign country. We don’t want mass panic, so don’t admit Ebola is out of control. Can’t have that terrible mass panic, don’t tell them we are hours away from economic collapse when all bank functions collapse. Don’t panic the sheep and admit the power isn’t coming back on because that was an EMP and not a neighborhood blackout. Not that they could tell you since the power went out, but I trust you take my point. The nation state has an implicit contract. Pay your taxes and obey the laws even if no cop is watching, and we will do our best to protect you. When they fail to protect you, that is probabilities and strategic issues, as long as they TRIED. Now they don’t even try, and go beyond even that and actively try to harm you for their own power and profit. You have no moral obligation to uphold your side of the bargain, since they abandoned theirs. And there is why you have the breakdown of social order. One party reneged on the agreement, so why should the other party feel any moral compunction? In what other environment could Hilary call for civil war, on television, and not be arrested or at least mobbed and tar and feathered? It is one thing to warn of consequences, another to empower and instigate. Yes, I understand there is far more to it than the surface concerns. My point being it is indicative of the break in the social contract. You need to understand that every word or statistic from the government are just more lies. It isn’t that the lies are being discovered more often. It is that there are so many lies that they cannot be hidden. So don’t plan on X amount of time before collapse, because all the information you base that on are from government lies told to keep order. note: free book. Zombies https://amzn.to/2yxaGhF . LDS has a history of getting their butts kicked. It only makes sense they have a solid plan to make sure their members survive. Who knows what the government is not telling us? I got a stack of stuff from 25 years ago I can't talk about. I can only imagine the pile they got now. Yep Jim. Minions have all learned: Your employers lied to you about advancement opportunities, improved benefits, no lay offs were coming etc. Your wife / partners lied about loving you whole heartedly for ever after. Product and services providers lied about being able to trust their goods or service provided. Add that on top of what the governments at all layers have done, repeatedly. After several decades of eating that horseshit, "Minion Mikey" doesn't like it anymore. "Let's give it to Mikey" used to be a cereal. Now a suppository. I'm turning over a new leaf on 01 Jan 2019. I'm going to stop letting this rotten assed gov't have free rent inside my head. Mostly. It gains access now primarily through the internet, which is quickly becoming irrelevant for me. I have to replace the internet with other things to occupy my mind and time. Everything news and gov't is negative and that can't be good for you. Birds of a feather and all that. I'm a thinker and an artist of many things and I'm going to focus more on that stuff. And read, and shoot guns and play the hell out of loud assed guitars. And prep of course. But LESS rotten assed gov't and news. I'm on the other side of the hill now and it has effected my thinking. Every day that passes now is one less I have. Scary stuff. All my tomorrows are here. Now. Sounds like a heck of a good plan. All you control is your time and your attitude. You're mostly there, it seems. GS - Smart phones are my bug bear. What *could* have been a great boon for the average man turned out to be the worlds greatest spy device. I hate it but what do you do? In dingoland it's not possible to buy a mobile phone that doesn't have GPS or internet capability. IOW even the cheapest phone tracks you. Note to my bison friends - that guy muredered by the saudi in the saudi embassy. They had an audio recording of it from his apple watch. The Saudi recording: doesn't that seen a bit convenient? I don't know details, but it almost seems like a set-up. No way that iWatch could have transmitted to some iPhone outside the Consulate. No way. Don't believe anything you read about this incident. Nothing is as it is presented. These are hard times for casual data collection. The nation state's singular goal is to ensure the nation state survives. True, and it ensures its survival by winning the consent of its inhabitants. You know its time is up soon after it starts working against them to survive.